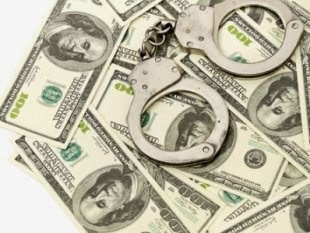 "Directly Destroying Democracy," an article by Leo Gerard at Alternet.org, explains how democracy can be destroyed with the Conservatives' best weapon -- money, money in the form of legalized bribery. When you finish this article, try "America For Sale: The Road To Oligarchy." "In the olden days, buying votes was a risky business. That’s not because the purchaser faced felony charges. No, the real peril was that the guy bribing voters wouldn’t get what he wanted. "The process was too indirect. The man with 'walking around money' would tell voters what he wanted them to do in exchange for a few beers or bucks. But Americans, being the contrarians they are, could cast their secret ballots for the exact opposite candidates, then accept the booze anyway, thank you very much.These days, there’s a much more direct process. One percenters and corporations can secretly buy politicians. 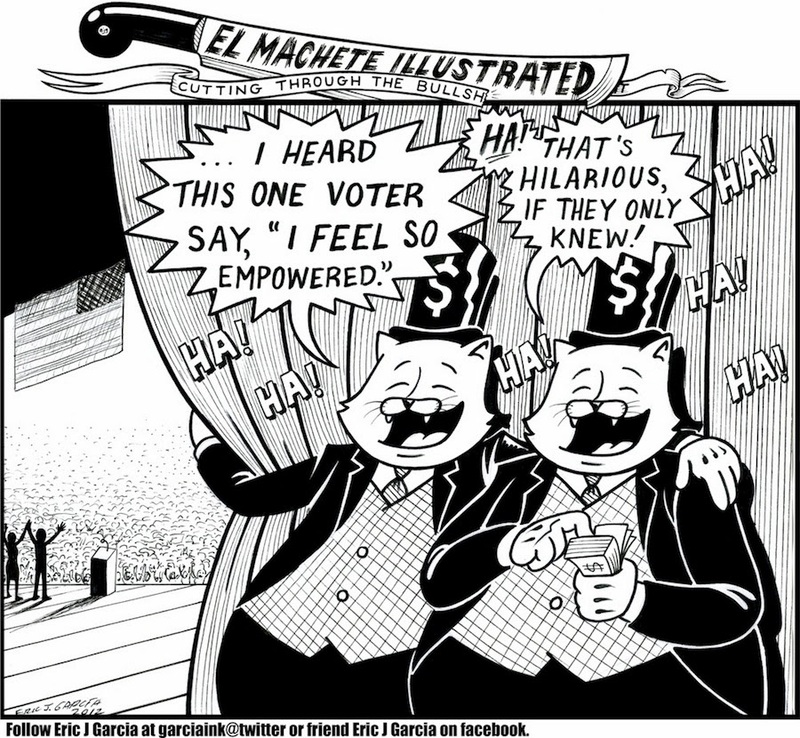 Using front groups, the wealthy can 'donate' unlimited millions to elect a candidate and remain completely anonymous. So the public won’t know that the senator pushing for smiley faces to be printed on cigarette cartons instead of health warnings received $50 million in ads paid for by the tobacco industry. "Several news stories last week illustrated exactly how this threat to democracy, sanctioned by the gang of right-wingers on the Supreme Court in the Citizens United case, plays out. The most jaw dropping is the case of former Republican Utah state attorney general John Swallow, who used shadowy nonprofit organizations to conceal hundreds of thousands of dollars in donations from the vilest industry in America – payday lenders. "In exchange for the money, Swallow promised to use the office of attorney general to champion payday lenders, the flimflam men who exploit and bankrupt the poor with short-term loans at exorbitant interest rates. "Swallow made bald promises to this despised industry. In one letter to a Tennessee payday executive, he wrote, 'I look forward to being in a position to help the industry as an AG [attorney general] following the 2012 elections.' In another, he pledged to ward off regulation by the new federal Consumer Financial Protection Bureau by organizing a posse of other right-wing attorneys general. "Swallow knew, however, a payday lenders’ water boy would disgust voters. So he and his associates shrouded the payday lender donations with a bunch of 'social welfare' nonprofits, which don’t have to report who contributes, the New York Times reported last week. "The scam disintegrated when the Internal Revenue Service began investigating one of the shady nonprofit groups that contributed to Swallow. Other inquiries followed, and Swallow resigned after less than a year in office. "Swallow’s payday lender benefactors didn’t lose their investment so quickly in another case, however. They bought ads vilifying Utah state representative Brad Daw, who had pushed for legislation that would have barred payday companies from loaning money to people already deeply in debt. After the payday lender-sponsored attacks, Brad Daw, a four-term lawmaker, lost his primary. Payday regulation defeated! "Payday lenders, justifiably, don’t enjoy high public approval ratings. 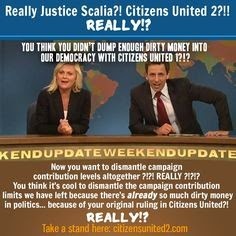 Yet, thanks to the right-wingers on the U.S. Supreme Court, they can circumvent democracy with boundless cash and get candidates elected or rejected. 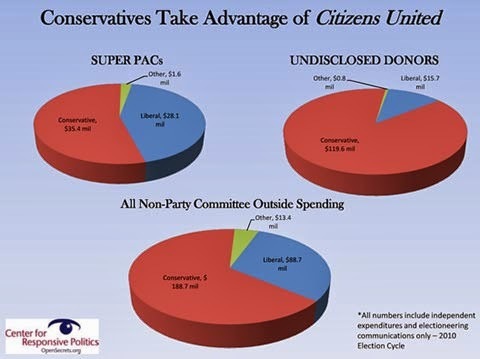 "What the right-wing justices ruled in the Citizens United case is that government can’t limit the amount of money corporations spend to get a candidate elected, as long as they don’t hand the money directly to the candidate. "New Jersey Gov. Chris Christie, the Republican of Bridge-Gate infamy, provides an example of how badly this sort of purchased politics plays out for citizens. In 2009, hedge fund manager Paul Singer donated $100,000, not to Christie, but to the Republican Governors Association. The Association, in turn, aired ads for then-candidate Christie. "At the time, The Nation magazine reported last week, Christie was blasting the Democratic gubernatorial incumbent for what Christie asserted was unethical investment of public employee retiree money on Wall Street, where risk and fees are higher and returns are lower than with traditional conservative investments such as U.S. Treasury notes. "Christie won and almost immediately after taking office began investing New Jersey public employee retiree money on Wall Street, with of course Paul Singer’s hedge fund. A former trustee for another state retirement system estimated for The Nation magazine that Singer’s fund collected $8.6 million in fees from the New Jersey investments – for one year, 2013. That year, Singer gave $1.2 million to the Republican Governors Association, which by then, Christie chaired. "That’s good for Christie, a potential presidential candidate, of course. The same can’t be said for New Jersey workers and retirees. With an unusually large portion of the state retiree money in the hands of hedge funds by 2013, New Jersey’s return, at 11.79 percent, was significantly lower than the median return on pensions that year of 16.1 percent. 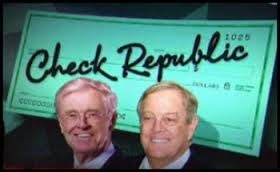 "The right-wingers on the Supreme Court are expected to rule any day in another case, McCutcheon, that would further empower the wealthy to buy the political process. "Right now, there’s a limit on the aggregate amount a person or corporation can contribute directly to candidates during a two-year election cycle. The right wing justices are expected to eliminate that cap. "It’s $123,200. The average American doesn’t make that much money in two years. "So, it’s no wonder that politicians don’t do what average Americans want. Significant majorities of average Americans think Congress should raise the minimum wage, extend unemployment insurance, lower income inequality and provide a path to citizenship for immigrants. But these are not the priorities of the 1 percent or of corporations. And, naturally, they are not the priorities of the politicians who owe their victories to buckets of cash from the 1 percent and corporations. "The rich can buy more of everything. More food. More cars. More houses. More vacations. More boats. 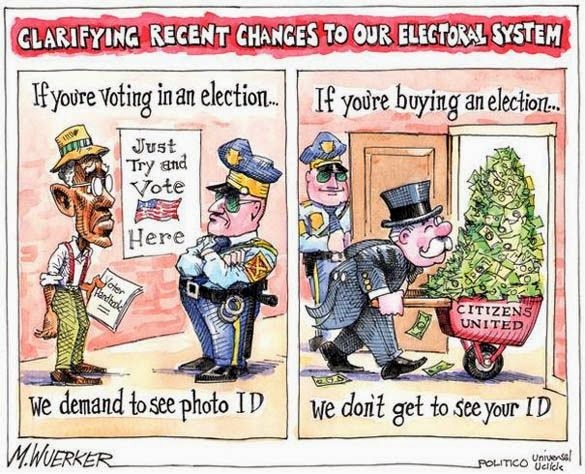 But for a democracy to function properly, they should be forbidden from buying more votes. 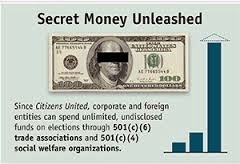 The article opened referencing the Citizens United case, making us see how bribery was legalized by the SCOTUS Fascist Five. When criminal types declare something legal that everyone knows is illegal, then their declaration is null and void. And the decision to let Conservatives buy our elections with hidden money, tons of illegal money, makes the old Mafia capos look like amateurs. Once upon a time we knew that hidden political contributions were an invitation to the Mafia to buy our politicians and control our government, and we thought that the logic was unassailable then. 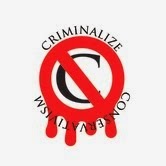 But Conservatives are criminals with much more power than the now defunct Mafia, and if democracy is to survive, the vast criminal conspiracy that is called "Conservatism" must be controlled, it must be criminalized.